In this delightful, acclaimed best seller, one of the world’s leading cognitive scientists tackles the workings of the human mind. What makes us rational—and why are we so often irrational? How do we see in three dimensions? What makes us happy, afraid, angry, disgusted, or sexually aroused? Why do we fall in love? And how do we grapple with the imponderables of morality, religion, and consciousness? How the Mind Works synthesizes the most satisfying explanations of our mental life from cognitive science, evolutionary biology, and other fields to explain what the mind is, how it evolved, and how it allows us to see, think, feel, laugh, interact, enjoy the arts, and contemplate the mysteries of life. This new edition of Pinker’s bold and buoyant classic is updated with a new foreword by the author. Worth listening to the entire book. it touches on a lot of different ideas and sometimes stays on a single idea too long, just push through and youll be glad you did. This performance brings the book alive, it's feels like a great conversation, and it brings Pinker's sense of humor to live. This is a very broad and also detailed work. The first three quarters of the book is a really interesting investigation of mental processes backed up by concrete descriptions of experimental results, with a constant return to the central thesis that the mind evolved to be the way it is. The last part, in which more abstract concepts like altruism, religion, and music are analysed, struck me as more hypothetical and speculative, although the context and reasoning behind his claims are very interesting and well reasoned. It is an intresting read but i find it to limited in content. It tries to sell very simple ideas and donot address the complex issues. Being a medical professional with some amount of physchology study. I found the book non engaging to me. May be i was looking something different. But still it interesting read. What made the experience of listening to How the Mind Works the most enjoyable? Pinker answers a lot of questions about how and why people think the way they do. As always, he doesn't just make assertions, he backs everything up by explaining the state of the research and the ideas of the researchers in the field (even when those ideas are different from his). It's a much easier read than actual research papers, and has wit and good story telling to leven the large doses of information, but it's not easy to follow when listening. It requires a lot of concentration or you can do what I did and just listen to everything twice, sometimes three times, until you get it. If you consider yourself an intellectual, you'll want to be familiar with Stephen Pinker's work. The Better Angels of our Nature, and The Blank Slate are easier to pick up just listening once so I would recommend one of those as a place to start. This book was written more than 10 years ago. It's holding up very well though and an afterword written only a couple of years ago is included which explains how recent research relates to the book. This is one of my favorite books, and the audio format does not disappoint. If you're interested about human nature, why we are the way we are, why we're so smart, why we're conscious, and even why fools fall in love, this book is for you. (But be warned, this book is for people who like to think; don't expect to breeze through it like a malcom gladwell book.) Also, one recommendation: unless you're really interested in visual perception, I would recommend skipping the chapter called "The Mind's Eye," as it is hard to follow in audio format without the pictures, and it is the most technical chapter. Yes, I'd definitively recommend it to friends. The book is very interesting, but Pinker got the title wrong. The book explains very well WHAT the mind works, and WHY does it make sense that the mind does what it does. But the book NEVER explains HOW the mind does it. The most interesting is the variety of topics covered in the book. Full with interesting specific cases and references to studies. As much as those ideas are interesting, they are old and well accepted. So, the book is just a nice way to put them together, but without bringing any new argument to the discussion. The performance of Mel Foster was outstanding. In this wonderfully informative and entertaining book on the human thought process, the source of emotions, sexual desire and everything else this marvelous three pound lump of spam in our head does for us, Pinker writes in the intelligent but amazingly amusing and witty style that makes him one of the greatest translators of complex science into lay terms, in the main because he does so without compromising or dumbing-down in the process. It is no wonder that this man is considered one of the greatest minds of our time. Buy the book and find out how his, and everyone else's works--and why. Would you listen to How the Mind Works again? Why? Yes, there's. Lot in here, some 25 hours worth of listening, and I want to come ack and listen to some things again! What was one of the most memorable moments of How the Mind Works? Love Steven Pinker, and would like to just read more. It's so refreshing to hear all the concepts related back to actual studies! I enjoyed this as much as the Blank Slate, possibly more. I got this audiobook on sale for $4.95 and probably wouldn't have gotten it otherwise. I really liked Eagleman's Incognito, Lehrer's How We Decide, Nørretranders' User Illusion and even Kahneman's plodding Thinking Fast and Slow, so How the MInd Works seemed like a good fit. The author is not particularly interested in how the mind actually works (and when he does talk about the mechanisms of thinking, he gets terribly bogged down in computer programming minutiae). The book is actually about evolutionary biology, and Pinker spends a huge amount of the book bashing feminists and sociologists. The book was written in the 90's, so the author had probably been on the receiving end of a lot of fuzzy thinking about everything being socially constructed, but his harping makes the book seem incredibly dated (especially compared to the User Illusion, which still seems very fresh). I would also say that as the mother of a truck-loving toddler girl who has been told by other mothers that "girls don't like trucks," I see gender roles being socially constructed every day. Meaningful information and definitely worth listening. The book does get off into the weeds at times which added to the length. it could be much less verbose and still convey the message, maybe an abridged version. 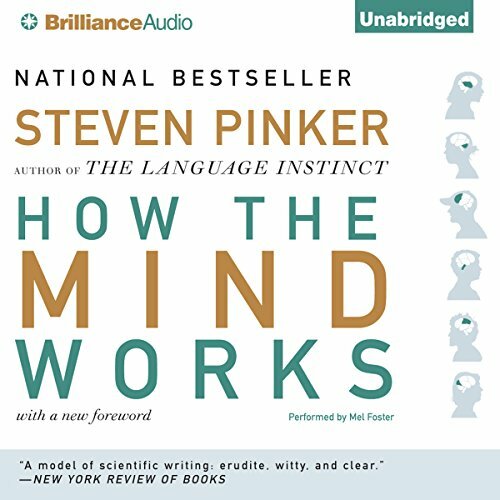 Where does How the Mind Works rank among all the audiobooks you’ve listened to so far? I have consumed countless books, lectures, seminars, and podcasts about science, skepticism, critical thinking, behavioral economics, evolution, meta-cognition, and everything else that this book touches on. Pinker goes above and beyond by linking it all together in an engaging way. The concepts are deep but he breaks them down in such a way that they become simple. Not applicable - this is non-fiction. What does Mel Foster bring to the story that you wouldn’t experience if you just read the book? Excellent pace and tone. Auditory cheesecake! I laughed several times, and it made me think very deeply and in new ways about many very basic concepts about life, relationships, and thinking. Though we may be sacks of meat through-and-through we still manage to find each other beautiful, and that itself is beautiful. What did you love best about How the Mind Works? Based on scientifically determined information with a clear examples of the scientific method. What three words best describe Mel Foster’s performance? Performance is difficult in a work of this sort which presents a lot of scientific information. Difficult territory, meticulous, and matter of fact. Summarizes a lot of material and information without tying all together, but that may be a function of the information which doesn't fit into a neat easily summarized comprehensive thesis. If you could sum up How the Mind Works in three words, what would they be? The concept about the diferent modes that the brain processes information is interesting, still I think needs a little polishing. The narratives of personal experiences are very interesting when heard with the tone of voice of the person that experienced them. It is a profound book with many concepts which I prefered digesting in various sesions. I listen to it while jogging and it was perfect. Very detailed and most concepts are supported by examples, still there are some times that ideas were presented without too much support.